How does Donald Trump swallow NOT getting his wall money? The members of Congress are patting themselves on the back for engineering a ‘deal’ to keep the government running for without a shutdown again…. Donald Trump has this to deal with this…..
“By the way, on this new so-called compromise, getting details — $1.3 billion,” he said. “That’s not even a wall, a barrier? I’m going to tell this tonight, and we will get back into this tomorrow — any Republican that supports this garbage compromise, you will have to explain. Look at this crowd. Look at the country. Look at CBS News. Even they say 72 percent of the American people want the heroin to stop, the cartels to stop, the gang members to stop and those that wish us ill.”….. 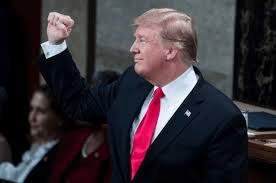 It appears that Trump WILL sign off on the deal which Trump’s party leaders WANT STRONGLY…. So what does Donald Trump do? This IS NOT about the ‘Wall’ folks…. This about a guy, who is masquerading as the President , doing what he was elected to do….defy Washington and the status quo…. So while Congress has not given him what he wants? But WILL begin to go around them stealing money from other programs to try to build a wall that would make no sense , but looks good for those who he is the solely the President….His base…. Doing this will create problems for Trump and could fail…. But Trump could ride the perception that he IS trying to fight the very Washington he is supposed to be the leader of…. But the strategy is far from a cure-all for a president with no good options, and it has already sparked debate within the White House…..